Your massage therapist has finished and left you to get dressed. As you meet her outside the little room, she hands you a bottle of water and encourages you to hydrate, hydrate, hydrate. Are there real advantages in doing so? According to Michele Naumann Carlstrom, licensed massage therapist at the Hospital for Special Surgery in New York, there are a couple. During the massage, your muscles are kneaded and worked, which releases fluids from the tissues into the circulatory system. From there it hits the kidneys, and you must flush it from your system. How many of you have to urinate shortly after a massage? Your muscles produce metabolic wasted daily. The second reason to drink water after a massage is to get rid of that. When conditions that cause you to be on a massage table, to begin with, are present, such as knots and tight muscles, the body is somewhat inhibited from flushing metabolic waste. Massage releases those knots, relieves the tightness and improves circulation, allowing your body to purge the waste. The American Massage Therapy Association backs these facts and recommends drinking water after a massage for similar reasons. Drinking water is a good idea in general. According to MayoClinic.com, water is used for a variety of functions in the body, such as moistening tissues and protecting internal organs, dissolving nutrients to be absorbed by the body, lubricating joints and regulating body temperature. Water makes up about 60 percent of your body. In addition to the functions listed above, water helps the kidneys flush out waste products as well as help in oxygen transport to the cells of the body. Without enough hydration, you can become lethargic, have memory and focus problems, dry skin, dry eyes, dry mouth, constipated, bloat, muscle cramps and more. Daily water recommendations vary from different sources and from person to person. MayoClinic.com says three strategies are common: replacing the amount of water lost based on urine output, drinking eight 8 oz. glasses of water per day, or consuming a specified amount--roughly 0.75 gallons for men and a little more than a half-gallon for women. 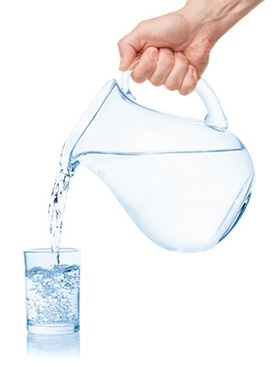 And finally, as if we didn’t give you enough reasons to drink up, one of the best ways to boost your odds for not being sore after a massage the next day is increase your water intake after your appointment. If you want to feel better and be healthy, be sure to take that water your masseuse offers when you leave!